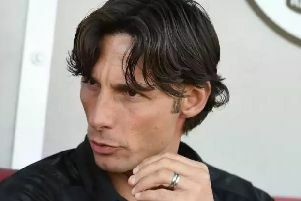 Gabriele Cioffi syas the Crawley Town is the right environment to start his adventure as a manager. Cioffi was appointed as head coach of the League Two club this morning(Friday) and will take charge for the first time for the home game with Morecambe next Saturday. He will be at Lincoln tomorrow as an observer. The 43-year-old Italian is delighted to be in the jo On what attracted him to Cralwey, he said: "I think we both trust each other. "I have to thanks Mrs Derham and Mr Selim for this opportunity. When someone offers you a job like this, it is a great chance for a coach. I don’t need a job. I wanted this job . "I trust the potential of the team. For two or three years I have been following League Two and League One. "I think it was the right step for me career and the right environment to start my adventure as manager." Crawley Town were targetting the Play-Offs this year but the departure of Harry Kewell has disrupted the plans for the year. Cioffi said: "Everyone has expectations. My wife has expectations every day. I have one rule in my life, private and work life, work, hard work, trust in the goal and targets. "At the moment the targets the club and I have are matching. I think this season started with an unsure step, and I am not saying a wrong step, an unsure step so we have to make this step solid, comfortable and then we can start to walk and one day we will run. "Everyone wants to win games.If I start to lose gamnes, I am the worse coach for Crawley. If I start to win games I will be the most funny and expertised coach for Crawley in the last 35 years! "We agreed that this team need to be in a comfort zone. This comfort zone we will find together and we could be sfae easily and challenge for the play-offs." And fans will be delighted to hear what kind of person the 6ft 6ins former defender thinks he is. He said: "If you ask me direct, I am a winner. Being a winner doesn't mean you have to win every game. But every day you wake up, you have your goals clear and every minutes of your life focussing on that goal."